Car Paint Sealant is not wax. Do you know the differeance? Trying to find the best car paint sealant is like trying to hit a moving target in the dark! It is an area full of bad information that is continuously spread around from one misinformed person to another. Not to put the entire blame onto the misinformed public, but we are forever at the mercy of marketing and advertising that has one agenda only; to sell you more and more product! Whether you are looking for the best rated car wax, or the best car paint sealant, unless you know the difference between these two very distinctly different products, you will be making misinformed decisions. I want you to become part of a select group of people known as the informed! Let me take you through a question and answer session that will leave you a much more informed decision maker so that you will get the desired results that you are looking for when it comes to the beauty and protection that is possible with the right car paint sealant. Q. Is there really a difference between a car wax and a car paint sealer? A. Yes. Was that simple enough for you? But that hardly answers your real question does it? What we really want is to know the actual difference between a wax and a sealant. Q. So what is the difference between a wax and sealer? A. Wax products will have some form of a natural wax product contained as part of the ingredient list which may include, but not limited to carnauba, bees wax, Montan, etc. Sealants will be made using synthetic ingredients. To add to an already confusing area of car paint care, people as well as the industry itself forever interchange terms like polish, wax, and sealants. Unless you are part of the informed, and you read package labeling carefully, it is often hard to know what you are getting. Q. I heard that carnauba wax is the best auto wax to use. A. Let me do my best to explain how this works. 'Best' of anything will be a person to person judgement call based on what their goal is. For example, do you want the "best" visual enhancement of your cars paint, do you want the "best" in protection, or does "best" mean the easiest to use for you? Unfortunately, we have to pick and choose as the technology does not exist in which a single product comes with every possible benefit. Remember, we have already noted the difference between car waxes and synthetic sealants. 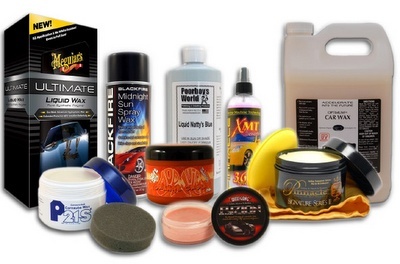 There many types of "natural" waxes used to make car waxes, eg. bees wax, carnauba yellow, carnauba white, etc. Most often car wax products will use carnauba wax as the main wax ingredient since this form of wax is marketed as the hardest of all wax forms. The misleading part of this is the fact that carnauba wax is rock hard in its natural state, and is completely unusable. It must be refined with other ingredients such as petroleum distillates, etc. to make usable. So when a manufacturer is labeling a car wax product as 100% natural, or 100% pure carnauba, they are referring to the purity of the carnauba wax used within the product, versus the overall content of product as a whole. Q. What would be the reason to use a sealer over a wax? A. Sealers are the place to go for ultimate in durability and protection. Sealers contain polymer technology and are the result of advances in chemical engineering. These products last the longest, are usually easier to use, and add a slippery and slick feel to your paint that is unlike that of natural carnauba car waxes. Q. What are the best uses for sealants? A. Sealants are perfect for people looking to wax or seal their cars less often, rather than more often. Also ideal for such as water craft and RV applications where most people are looking to have the longest lasting protection due to the conditions these large items must endure, and for the basic fact that they are large and make frequency of wax applications unlikely. Q. 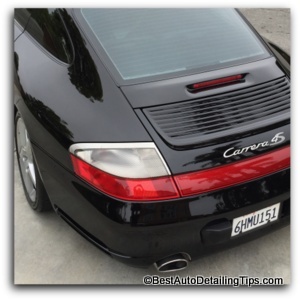 What are the draw backs to using car paint sealant versus carnauba waxes? A. While a car paint sealant is the ultimate in protection and durability, you will compromise on visual results that carnauba paste waxes are known for. Paste waxes have always been associated with the ultimate in depth creation and glossing for paint. Q. Can I get the best of both worlds by applying a car paint sealant first for durability, then apply a car wax over the sealant for visual performance? A. YES! Many enthusiasts and professional employ this technique and is one practiced by many of those with dark colored cars. "Darren, I now know and understand the difference. So tell me what you use and recommend as a professional." 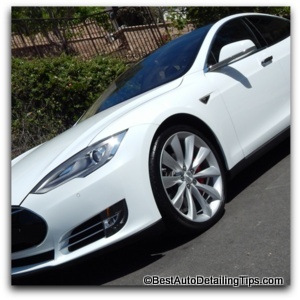 If you are looking for my complete write up and comprehensive review in the best car waxes, you can go over to best auto waxes. Just like every other area of life; things evolve. And when it comes to car care products that relies on chemistry, technology, and manufacturing, the products that advances make in all these areas are naturally going to continue to produce better and better products. Which is why this industry is such a moving target! What you might have considered the best of anything today, may be eventually replaced with a new product that truly out performs and out delivers your old product of yesterday. And for this reason I am continuously updating my own "newest" favorites. And one of my newest favorites in the area of car paint sealants is this product put out by a long time industry leader called CarPro. As easy as easy gets with this liquid version of car paint sealant. Traditionally thought of as only a "topper" for ceramic coatings, this is an excellent stand-alone car paint sealant that will perform to the level of any other traditional paint sealant. Will not stain black trim and is actually very good for all materials on the exterior of your car. You will be amazed at both the results this product produces, and the ease of use. A product that represents an amazing winning balance of features! One of the actual car paint sealants I use professionally. Actually mislabeled as it is a synthetic blend of polymers rather than an actual carnauba wax. The only product I use and/or recommend by Mothers. Wolfgang is a favorite among many professional detailers. As the label suggests; professional grade paint sealant. You really can't go wrong with any of these professional grade sealants. The feel of a car that has been sealed with paint sealant is a different experience than that of a carnauba wax product. When you follow the following steps, the silky smooth and slick feel of paint sealant is like no other. Remove any surface contaminants using a clay bar kit. Apply your choice in one of the above car paint sealants. Let your family and friends know that the ear to ear smile on your face is not due to mischievous behavior, but the sheer delight of silky smooth car paint done right! Understanding the difference between a car wax and a car sealant, you can now make an informed decision. You can help me by paying it forward and sharing this information to your favorite social media site and let others learn from the information I have spent much time compiling. And don't forget to tune into my YouTube channel for all my video tutorial and product reviews!